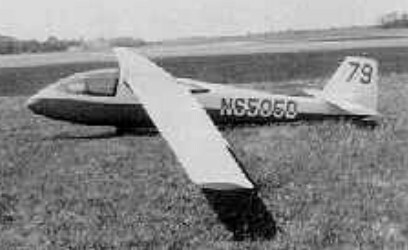 The R. E. Schreder designed all metal HP-9 was intended to fly in the Standard Class at the 1960 World Championships, but was not completed in time. It has an all-moving horizontal tail, retractable wheel, airbrakes and Fowler flaps which increase the wing area to 13.35 sq.m/ 143.7 sq.ft when extended, reducing the sink to 0.64 m/s/ 2.11 fps./ 1.25 kt. @ 76 kph/ 41 kt/ 47 mph.